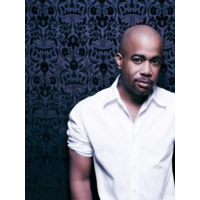 Darius Rucker (born May 13, 1966) is an American musician. Born in Charleston, South Carolina, he first gained fame as the lead singer and rhythm guitarist of the rock band Hootie & the Blowfish, which he founded in 1986 at the University of South Carolina along with Mark Bryan, Jim "Soni" Sonefeld and Dean Felber. The band has released five studio albums with him as a member, and charted six top 40 hits on the Billboard Hot 100. Rucker co-wrote the majority of the band's songs with the other three members. He released a solo R&B album, Back to Then, in 2002 on Hidden Beach Recordings but did not chart any singles from it. Six years later, Rucker signed to Capitol Records Nashville as a country music artist, releasing the album Learn to Live that year. Its first single, "Don't Think I Don't Think About It", made him the first African American to chart a number one on the Hot Country Songs charts since Charley Pride in 1983. It was followed by two more number-one singles, "It Won't Be Like This for Long" and "Alright" and the number three "History in the Making". In 2009, he became the first African American to win the New Artist Award from the Country Music Association, and only the second African American to win any award from the association. A second Capitol album, Charleston, SC 1966, was released on October 12, 2010, and was led off by the number-one "Come Back Song".